If you need great toddler boy gift ideas, check out the neat things we have picked out. It can be hard when your toddlers have older siblings as there are so many things that might be handed down. I love buying bath toys for toddlers as it’s fun to have really great toys to keep them busy while you are getting them clean. Toddler boys also tend to gravitate to toys with balls, cars and it’s nice to find toys that will keep them busy for long periods of time. To save our cool gift list to your Pinterest boards, hover your mouse over the photo above and press the “pin-it” button. With two full sides of toddler-friendly learning fun, the Laugh & Learn Servin’ Up Fun Food Truck serves up hours of role play and hands-on activities. Its blend of kitchen and vehicle play keeps mini-entrepreneurs busy—greeting customers, working the register, prepping ‘orders’ on the light-up grill, and more. And while they’re engaged in all that super fun role play, toddlers are also being introduced to sizing and sequencing, advanced vocabulary, manners, taking turns, and more with lively songs, sounds, and phrases! Three Smart Stages levels offer up different songs, sounds, and phrases, so the learning fun can keep going as your child keeps growing. Your toddlers will love these highly-reviewed Tegu Wooden Magnetic Blocks. Meet Magbot, an automated friend who’s ready to help you with whatever you need! In a quest to be human, this playful pal often falls to pieces, but the best part is creating new and different things every time thanks to the power of hidden magnets! Can Magbot exhaust your imagination? Magbot includes 9 blocks in 6 shapes: 2 Long Planks, 2 Short Planks, 2 Treads, 1 Magbot Head, 1 Torso, and 1 Wheel. They’re the perfect addition to any growing Tegu Block collection. “Click-Clack.” It’s the iconic sound of two Tegu Blocks coming together. Tegu has reinvented the wooden block in a way that brings new life to a favored classic. By safely embedding magnets into each piece, Tegu Blocks become curiously attractive for both kids and kids at heart. Defy gravity and push your imagination in ways never before possible. No instruction manuals or electronics; just toys that demand imagination and inspire limitless creativity across all ages. This Melissa & Doug Magnetic Car Loader Wooden Toy Set makes a quality, affordable gift set. Your toddler boys will love loading the numbered cars one by one, rolling to the next stop, then lifting and extending the articulated wooden arm to unload each vehicle one by one. Six sturdy pieces interact to make this exciting vehicle play set one of a kind: The solid-wood cab is easy to grasp and pleasingly weighty, ensuring a smooth ride for all. Its extendable magnetic arm is an exciting way for children to grab and move the four numbered cars, each with a unique coloration that lends itself to pairing and sorting fun. (‘Find all the cars with a yellow stripe/white light/the color blue.’) And the detachable trailer features stabilizing tracks that keep the cars in place when the trailer is in motion, or lets them slide back and forth easily when it’s time to rearrange. Designed to engage playful preschoolers and constructed with care to withstand their harshest treatment, this play set is made of durable, child-safe materials and safety tested to our most rigorous standards. The variety and wealth of possibilities is sure to inspire countless imaginative adventures. Let your little one set the tone with the Zoo Jams Stomping’ Fun Drums by Vtech. Encourage your little rocker to be a Star while they enhance creative thinking and motor skills by tapping out beats and creating their own sounds! your child will enjoy this fresh way to practice counting and develop coordination as they follow along with the melodies and sing-along songs or create their own rocking’ beats! your mini musician will love stepping on the elephant bass pedal to see the elephant trunk move up and down and create a fun bass sound effect. Watch them Jam out to the beat of their own drum and create some sweet rocking’ tunes. This super adorable and affordable, die cut, I am a Garbage Truck Board Book with captivate your boys. Kids that are facinated with garbage trucks or trucks in general will love this super simple book. It makes a great short read for parents too. If you need more book ideas, there is also I am a Dump Truck and I am a Firetruck. Zoom the wooden cars, build with the blocks, match the cars to their garages–there are lots of ways to play and learn with this Melissa & Doug Nesting and Sorting Garages and Cars! The seven graduated garages (all decorated with objects to count and bright colors to match) can be arranged to make a colorful town or stacked to make a tower tall with playing and learning opportunities. Then nest them for neat and easy storage! Best of all, each one matches one of seven stackable wooden cars by size, color, and number, opening up endless opportunities for stacking, counting, hide-and-seek, mix-and-match, hand-eye coordination, problem solving, and creative and imaginative play. Kids three and up will discover countless ways to play with this toy! Inflate-a-mals are a revolutionary new concept in the toy industry – inflatable large sized “stuffed” animals. These amazing new toys are inflatable, durable, and can even be placed in the washing machine if necessary. The inflate-a-meals lovable buddies are big, soft, cuddly and tons of fun. This unique kind of inflatable soft toy is stuffed with an inflatable PVC bladder that is easily blown up. They are as easy for mom and dad as they are fun for the kids. The characters come in a variety of large sizes, but when deflated, the will fit anywhere for easy storage and travel. I love these Green Toys sets as they are great for the bathtub, plus they are dishwasher safe for cleaning. More than its abundant sea life, the ocean offers amazing opportunities for playfulness and enjoyment to kids and adults alike. In conjunction with Sustainable Surf, Green Toys Inc. and All the Way to the Ocean have teamed up to celebrate Earth Day and support one of the planet’s most vital resources – our oceans – with the Green Toys Safe Seas Sets. These custom sets feature a Green Toys Seaplane or Submarine (in cool, limited edition colors!) and a copy of Joel Harper’s children’s book “All the Way to the Ocean” (Freedom Three Publishing), an uplifting story depicting how our daily life impacts the oceans and inspiring kids and families to do their part for a cleaner, safer environment. Sales of the Safe Seas Sets benefit Sustainable Surf, a 501(c)(3) non-profit charity organization dedicated to protecting the ocean playground and engaging communities to solve the most pressing environmental issues facing our oceans. Active toddler boys will love this fun, VTech Smart Shots Sports Center . This electronic sports center features a soccer net and basketball hoop for a fun 2-in-1 play experience. Your toddler boys can toss the basketball into the hoop to score points or kick the soccer ball into the net to hear fun sounds. Press buttons, turn gears and flip pages to learn about shapes, numbers and more. This really cute Playskool Mr. Potato Head Star Wars: Darth Tater Toy stands approximately 7 ½” tall. Darth Tater looks fierce and resplendent with his all black ensemble of hat, mask, cape, gloved arms and feet. His red, translucent light saber contrasts nicely with the black. Your toddler boys will taking mix-and-match parts to make the famous Star Wars villain on and off. Your toddlers will love grilling like the adults do with this Little Tikes Cook ‘n Grow BBQ Grill . The Little Tikes Grow ‘n Grill has two stages to grow with your child from toddler to preschooler. The traditional play kitchen gets a new twist as an outdoor toy grill. Anytime is grillin’ time with this toy grill barbeque set. It is just like a real gas grill with dual grill, lid, sink and side burners and everything stores easily inside the grill base. This set also includes a pair of tongs, 1 spatula, 1 hamburger and bun, 1 hot dog and bun and 1 bottle of ketchup. Older toddler boys will love this cute Learning Resources Pretend & Play Fishing Set . Its time to reel in the big one! Pretend and Play Fishing Set is perfect for outdoor vacations and more. Little anglers can hook the catch of the day. Adjustable vest makes play even more realistic. Play a size matching game with worms and fish. How adorable is this LeapFrog AlphaPup Toy ? Make letter learning a howl with LeapFrog AlphaPup! Toddlers ages 12 to 36 months will love exploring the ABCs as they walk their adorable puppy pal. AlphaPup is the perfect learning companion, singing the ABCs as he wobbles along behind your child. Children can touch colorful buttons to hear letter names, letter sounds, words that begin with each letter and darling doggie phrases. Your toddler boys will be thrilled to put on this Bell Star Wars Droid Toddler Helmet . The hard-shell protects their head on the trails and there are top and side vents to keep their head cool. Be sure to select from the available sizes. Yes! A bike that toddlers can use. This Schwinn Kid’s Balance Bike is made for older toddlers to learn to balance so they may learn to ride a real bike without training wheels. The 12″ Schwinn balance bike offers a unique foot to floor design which inspires confidence while teaching the fundamentals of balance. Air tires and tube for a easy roll, adjustable seat height for the growing child and adjustable handlebars. Your toddlers will love these Elephant and Piggie books like this I Really Like Slop! book. Toddlers and up will love the adventures of Piggie and Gerald and you can collect the entire series. Make bathtime fun with this neat Bath Toy – Submarine Spray Station . Bath toys are a great way to encourage learning and fun in the tub. This Submarine Spray Station is the perfect bath time toy for your little one! Yookidoo’s new bath toy encourages independent play and exploration, while teaching young children complex forms of cause and effect. Make bath time fun for your baby with this spray station, as they simultaneously improve their fine motor skills, hand-eye coordination and problem solving skills. The battery operated circulation pumping system that attaches to the bottom of the tub draws water through the submarine, up to the diver shower head. This Little Tikes Gas ‘n Go Mower Toy is so fun for toddler boys to push. The Little Tike Gas ‘n Go Mower children mimic the activity they see every day in the world around them. This outdoor toy comes with everything kids need to help keep the yard looking sharp! The sounds and hands-on features of this kid’s lawn mower encourage pretend play and get kids moving – and mowing! Your toddler boys will love this cute, Fisher-Price Harley-Davidson Motorcycles Tough Trike . Tough enough for years of outdoor adventures! Kids will love cruising along on this Harley Davidson-styled trike with durable and rugged tires that help take them wherever they want to go. Cool features like the secret storage compartment under the comfort-ride seat add to the fun! And the wide, stable wheel base, easy-grip handlebars and big foot pedals help even the littlest riders get rolling! 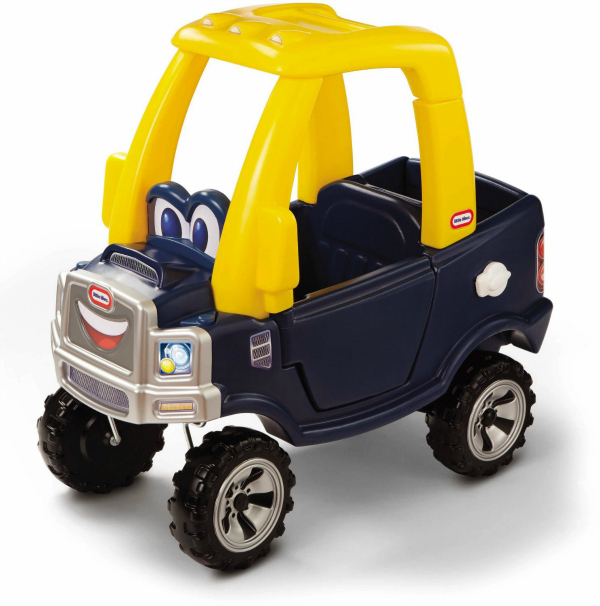 The Cozy Coupe is an old classic, but if you have toddler boys, they will love this Little Tikes Cozy Truck . It includes a flatbed with a drop-down tailgate and rugged tires, just like a real truck! The drivers door opens and closes to allow your toddler to easily climb inside. This fun truck works for toddlers 18 months old up until 5 years old. Green Toys is one of my favorite brands. I buy their toys all of the time for first birthday gifts. 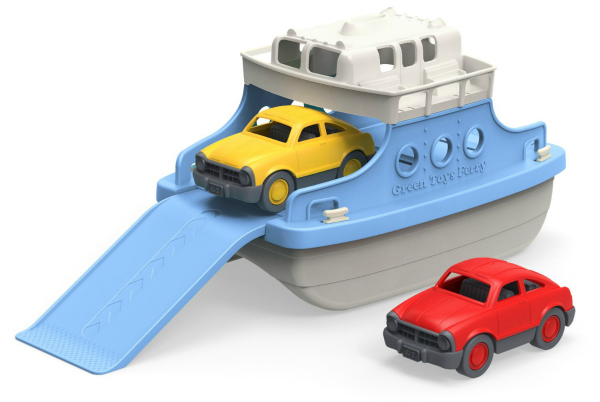 This brand new Green Toys Ferry Boat comes with two mini cars to load and unload off of the ferry. Parents love that Green Toys are dishwasher safe and made from 100% recycled plastic. They adhere to FDA standards and contain no BPA, lead, phthalates, or other harmful substances. What an adorable and fun way to sort shapes with this Melissa & Doug Animal Rescue Shape-Sorting Truck . 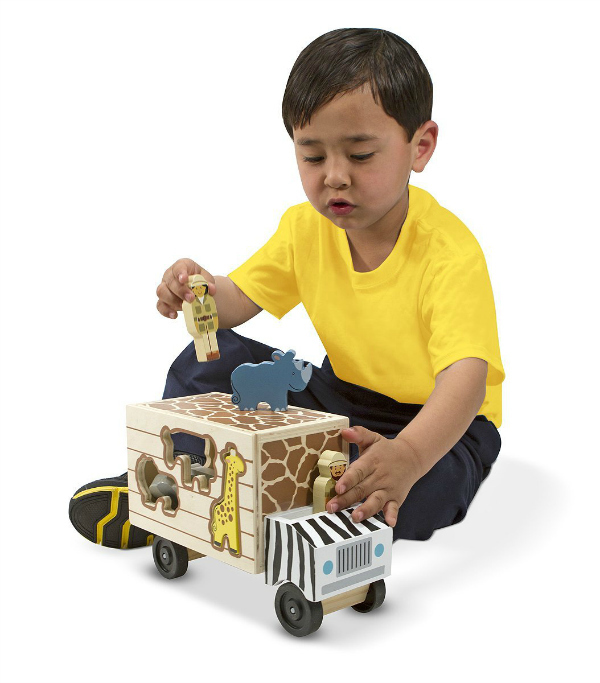 This truck is similar to a puzzle, but works as a vehicle, plus storage for all of the fun animals and zoo pieces. I love that this brand new, highly-reviewed toy is multi-functional. Your toddler boys will love this wooden board with latches, clasps and locks. 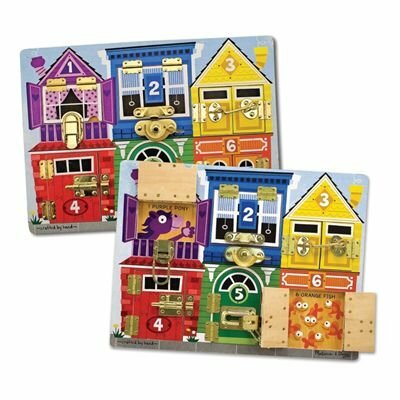 The Melissa & Doug Deluxe Latches Board will help with colors, size differentiation and help develop fine motor skills. If you need skills building toddler boy gift ideas, then this one will be a hit. 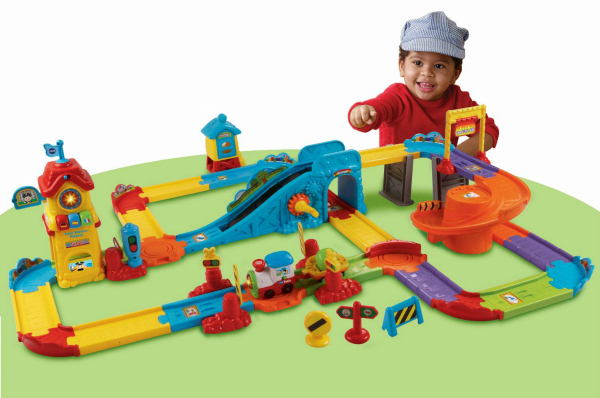 If you are looking for the perfect first train set for toddlers, check out the VTech Go! Go! Smart Wheels – Train Station Playset . It includes 32 interchangeable track pieces for 15 feet of fun, along with one motorized train. As the train passes certain points on the track, it triggers fun sounds, music and phrases. You won’t need to worry about wasting batteries with this one as it has a built-in automatic shut-off. Wooden toys are my favorite and I love how they last. 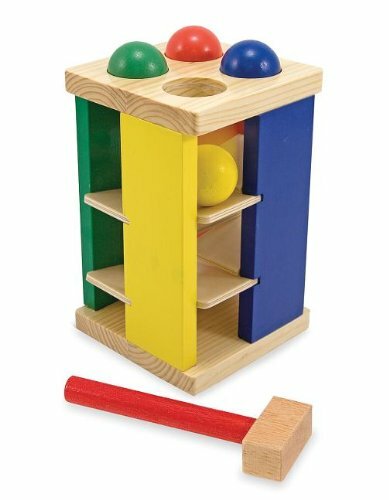 This simple, but sturdy Melissa & Doug Deluxe Pound and Roll Tower will keep your toddlers engaged. Pound the brightly colored balls and watch them roll down the ramps. Your toddler will learn early shape, size and color differentiation skills. 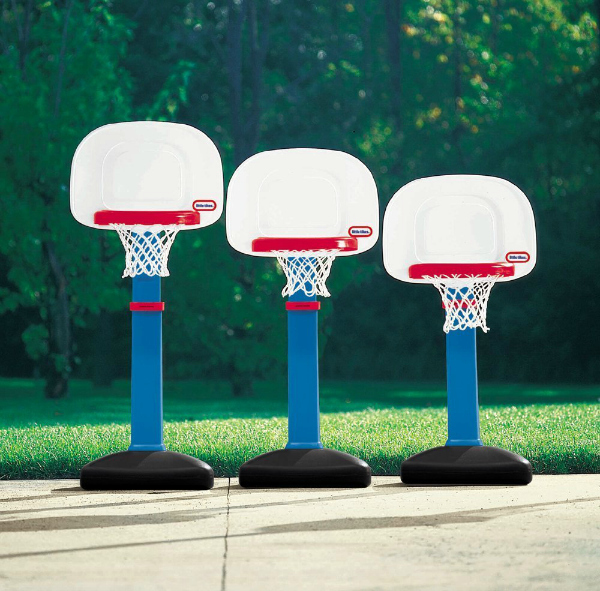 If you have a sports-minded toddler, then check out this Little Tikes EasyScore Basketball Set . It is adjustable and works for ages 18 months up until 5 years. This hoop will grow with your child and this hoop has a really nice price point. This is one of my favorite toddler boy gift ideas. It also includes an oversized rim and a junior-sized basketball. 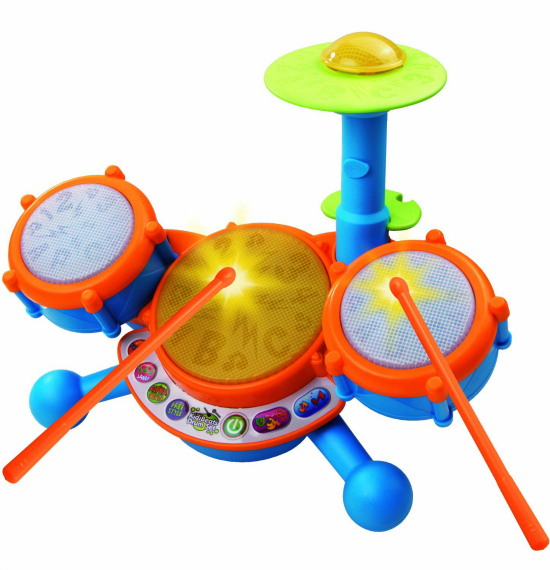 If your toddler boys really get into their music, check out the VTech KidiBeats Drum Set . It includes 3 small drum pads, along with a cymbol. It has 9 preset tunes they can play along with and the best part is that this toy isn’t too big or overwhelming to store. What a fun way for your toddler boys to enjoy their music. If you love this list of great Gifts ideas for toddlers and you need more gift ideas, , then check out our great gift ideas page. We will be adding more gift ideas and holiday shopping tips all month. Be sure to sign up for our free newsletter so all the updates comes right your inbox.